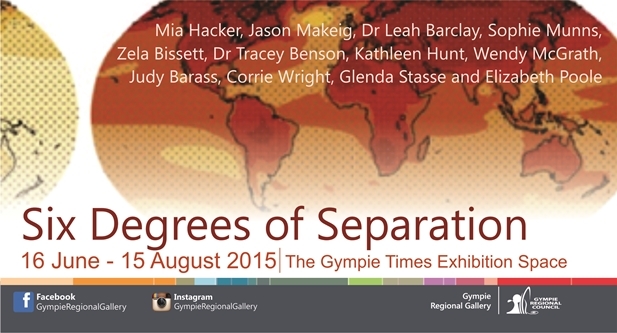 The ”Six Degrees of Separation” Exhibition at the Gympie Regional Gallery invited a select group of artists to explore climate change and environmental art. Leah Barclay was invited to showcase the latest installation from River Listening. The River Listening installation is presented as a immersive multi-channel listening space where listeners can lie down immersed in sound with a river bed floating above their heads. How will climate change effect us? What might future communities look like? How can we be prepared for the future? Join guest speakers Dr Marcus Bussey, Dr Leah Barclay, Dr Tony Fry and Zela Bissett, when these questions and more will be raised at this event held in conjunction with the exhibition “Six Degrees of Separation”, where twelve artists have responded to issues of climate change, whether real or perceived, in a variety of visual and auditory mediums. River Listening is an interdisciplinary collaboration between Dr. Leah Barclay and the Australian Rivers Institute that explores the creative possibilities of aquatic bioacoustics and the potential for new approaches in the conservation of global river systems. The project involves listening labs, field recording, sound maps, performances and installations to experiment with virtual technologies and community engagement in understanding river health and aquatic biodiversity. This immersive installation draws on hydrophone (underwater) recordings from the Mary River, Noosa River and Brisbane River in Queensland, Australia collected throughout 2014. The additional sonic material draws on fragments from Barclay’s previous rivers projects across Australia, Brazil, India, Korea, China and Europe. This includes the Amazon River Dolphin in central Brazil, water insects at dusk on the banks of the Pamba in southern India, snapping shrimp in Cambodia’s Tonlé Sap Lake and explorations on London’s iconic Thames. River Listening is a sound installation that reimagines the world beneath the surface of river systems. Aquatic environments we often think of as silent are actually dynamic acoustic ecologies that can help us understand the health of a river. This installation explores rivers as the lifeblood of communities and draws on ten years of collaborations with river systems across the world.